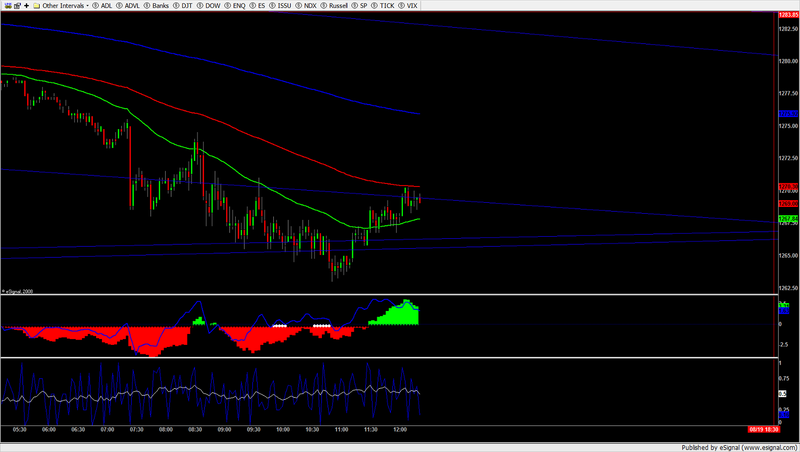 Anyone ever thought to draw trend lines and channels on RSI? Works really good on the 30min. Not a stand alone but WOW really complements my trading style. Often breaks the channel or trend line before the ES breaks...I'll post some charts later. just covered my long from 1263.25 at 1268.25. nice win...up 10.75 handles for the day. Too bad i only had one contract. That was the most asinine work for 6 handles I've ever seen. I'm targeting 57 for the next pony show and then it's all she wrote. I'm keeping 66 no matter the tricks. I know you guys think I'm off my rocker, and no one to include me knows why I care so much explaining myself, especially considering my calls of late, but chasing this dead bull all the way to rock bottom from here on out is going to blow accounts. We're in a tight rage chop decidely down from here on into overnight ending in what promises to be more than just a whimper from auction participants. BTW, do you like my channel work?